Speaking of #allpinayeverything, Barbara Jane Reyes wrote about Filipinas she taught in her USF class in 2012 in her Harriet blog article, “Filipina Lives and Voices in Literature,” for The Poetry Foundation. Worth mentioning again for Filipino American History Month #allpinayeverything. Thanks to Barbara Jane for mentioning Helen Rillera (Angelica Floresca Marquez) in The Commonwealth Cafe (scroll down to see article). But check out also her references to Colonel Yay Panlilio, Evangeline Canonizado Buell, and Jeanette Gandioco Lazam. 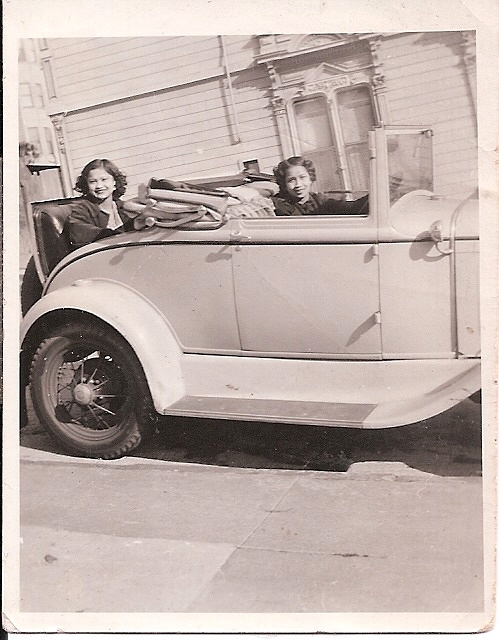 Helen Rillera (Angelica Floresca Marquez) at the wheel, in San Francisco, 1930s. Thanks to the Cacdac Family Collection. This year, it’ll be #AllPinayEverything in the CommonwealthCafe for #FilAmHistoryMonth. What have pinays contributed to the lives of Filipina/os and Filipina/o communities?